The Fulbright Program in Russia | Fulbright Summer School "Public Administration and Sustainable Development"
One of the highlights of the school's intensive sessions was a seminar on “Green Business, Innovation and Society” led by Professor Vince Duffy of Purdue University who spent the 2011-2012 academic year on a Fulbright scholar grant teaching at another National Research University, the Bauman State Technical University in Moscow. The summer school's faculty also included leading professors in the field from HSE and other leading universities in Moscow. Participants gave positive evaluations of the summer school's multi-disciplinary approach to the theme of sustainable development. Most of them had previously worked on only one or two aspects. The school broadened their understanding of the topic by helping them realize that effective sustainable development policy brings a full range of factors - economic, scientific, social, ecological, commercial and administrative. It also provided the opportunity to create a network of young regional experts who can work together to promote sustainable development. Summer schools organized and taught by Russian and US alumni of the Fulbright scholar program have been a unique feature of the Fulbright Program in Russia for over 15 years. Co-sponsored by leading Russian universities, the summer schools have a multiplier effect by providing an opportunity for Fulbright scholars to share the experience and knowledge gained from work or research in the USA with advanced graduate students and young professionals from all regions of Russia. Each summer school has 20 to 25 participants who are chosen through open, merit-based application processes run by Fulbright alumni in close cooperation with the Moscow office. The three summer schools being held in 2012 received a total of 328 applications. 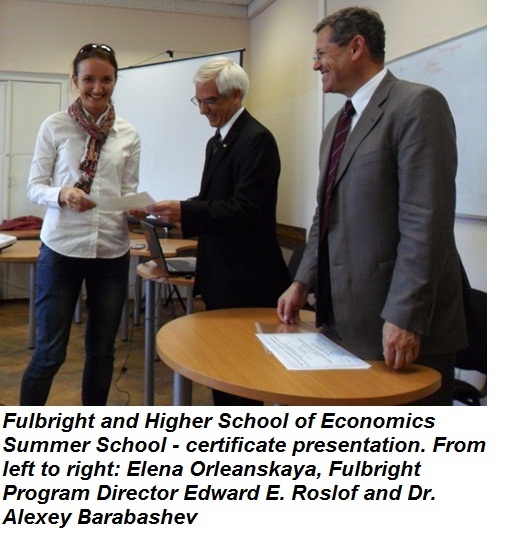 Summer schools strengthen the Fulbright alumni network and play a valuable role in recruiting excellent young Russian graduate students and faculty to apply for Fulbright grants. Themes of the other two summer schools in 2012 are “Green Technology” at Kazan Federal University and “The Humanities Across National Boundaries” at Moscow State University.